As the summer tourist season approaches, many restaurants are contemplating updating their menus to take advantage of this valuable target audience. Some managers add light dishes that correspond with warmer weather, while others offer seasonal cuisine to tempt wary customers. However, one strategy that will remain effective year round is to take a historical approach and recreate famous meals from the past. For example, Mother Nature Network reported that a restaurant in New York City is commemorating the 100th anniversary of the sinking of the Titanic by offering cuisine based on the menu served during that fateful evening. This particular menu provides oysters, Waldorf pudding, foie gras pate, roast duckling, lamb and five other dishes to anyone wishing to spot the hefty $115 price tag. However, this dish is available for a limited time only, so it is possible that customers will be attracted to its rarity. However, your innovations do not have to be this expensive. There are plenty of options that use ingredients obtained at discount prices. If you would like to get seasonal, consider the upcoming holiday of July 4th. What are some traditional American foods that would have been around during Revolutionary times? According to the History Channel, George Washington's favorite dish was something he called "hoe cakes." The first president apparently liked these "swimming in butter and honey," and they are essentially a 1700s version of what is now referred to as pancakes. So, in the month leading up to Independence Day, serve up Presidential Pancakes with the same dressings that our founding fathers used. To capitalize on the English and Irish heritage in the United States, you might consider serving meals like fish and chips or potatoes and cabbage. Anyone who has ever been to the United Kingdom can tell you how much the British enjoy fried fish, and potatoes have been a staple of the Irish diet since ancient times. Beverages like English breakfast tea can compliment any meal, and dessert like Irish soda bread can add a sweet finish to a meal. 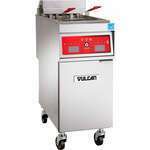 In order to help you recreate these famous meals, quality restaurant equipment like the Vulcan 36S-6B Endurance Restaurant Range may be used to whip up large amounts of traditional cuisine. The burners on top may be used to cook pancakes and other breakfast food, while the oven built into the bottom can prepare anything from potatoes to pot roast.